Now that the holiday season is fast approaching, retailers are doing everything they can to attract consumers. But what they’re not doing is getting consumers to shop using their retail apps. According to the latest Pulse of the Online Shopper report from UPS, four out of every five shoppers around the world have used a retailer’s app. The numbers are not so surprising as the rise of millennial shoppers mean that more purchases will be done on a mobile device. It’s a fact that people are on their mobile devices longer now and a huge chunk of that time is dedicated to shopping-related tasks. For instance, 72% of the time is used to track an order delivery while 69% is used to compare prices among various retailers. But despite these impressive numbers, a small segment of consumers are actually using a retailer’s mobile app, much to the consternation of these companies. 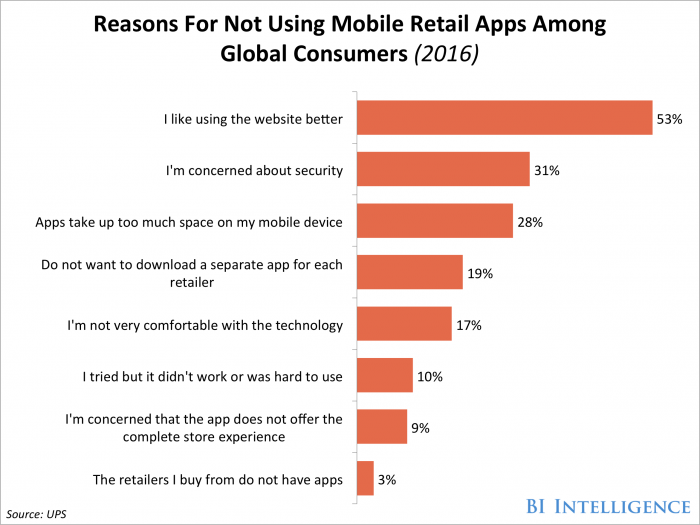 It would appear that one major reason why shoppers are not using retail apps is that they’re not aware their favorite shop has one. Business Insider mentioned that 64% of American consumers are in the dark about this issue. This is a big blow for retailers who have focused time and money on mobile apps because they give higher conversion rates than mobile browsers. It’s imperative for retailers to find a way to get around this visibility issue. Failure to do so will lead to the industry’s stagnation and can cause companies to miss out on the $285 million that consumers are expected to spend on mobile purchases by 2020. The UPS report also revealed that 53% of shoppers around the world prefer using a brand’s mobile website rather than the mobile retailer app. As a matter of fact, only 8% of shoppers actually use a retailer’s app in-store. The main reason for this is that these apps do not offer anything different from the brand’s mobile site. Shoppers want retailer apps that will give them a better shopping experience but they usually just receive the same incentives or discounts that they would get from the mobile site. It’s not surprising that a lot of people (31% according to the UPS report) are wary of using retailer mobile apps because of security concerns. Shoppers are worried because they don’t know how the stored information retailers will receive will be used. An app that’s not user-friendly or doesn’t work will definitely cause users to lose interest. This particularly holds true for retailer apps. The problem is compounded by retail brands not investing enough in these apps, with multiple companies outright dropping their retail apps from the App Store or from Google Play. Meanwhile, other retailer apps have not even been updated since 2016. There are also complaints about how retail apps are not optimized for mobile devices or how shoppers can’t access these apps in-store because of connectivity issues. One survey showed that 92% iPhone users deleted retailer apps because the program was too slow or it crashed or froze. While it’s a sad fact that many companies have not been able to utilize retail apps to their full advantage, luxury brand Gucci have figured out how to make sales through their app. Gucci has invested heavily in its retailer app and has used it to successfully integrate customers’ online and offline shopping experiences. Just recently, the fashion giant unveiled a new feature called the “Cabinet of Curiosities.” App users would have to scan a mobile sticker in Gucci’s store window displays to activate digital artist Ignasi Monreal’s latest masterpiece. Once done, shoppers can check out the brand’s 2017 gifts selection. Gucci is also using fun elements like stickers, emojis, and VR videos to attract consumers and boost the odds of securing direct purchases. Push for Wish Lists: Entice app users by offering deals that they can’t find on the mobile website or anywhere else online, like exclusive Wish Lists. Providing customized gift ideas, complete with price alerts and stock numbers could interest consumers into using the retail app. Reward Loyal Customers: Make your hard-core customers feel even special by giving them special information or early access to seasonal deals. This will stoke their desire to keep using your app and continue their dedication to your brand. Give Easy Access with Touch ID: Making it simpler and easier for customers to access their Wish Lists, Shopping Cart or Checkout will draw more in more users. Integrating a Touch ID feature will help with cart conversions. Getting your customers to download your business app and make purchases is a challenge. However, identifying your apps weaknesses and employing effective strategies to make it fun and useful to the customer could yield the boost in revenue your business needs this holiday season.